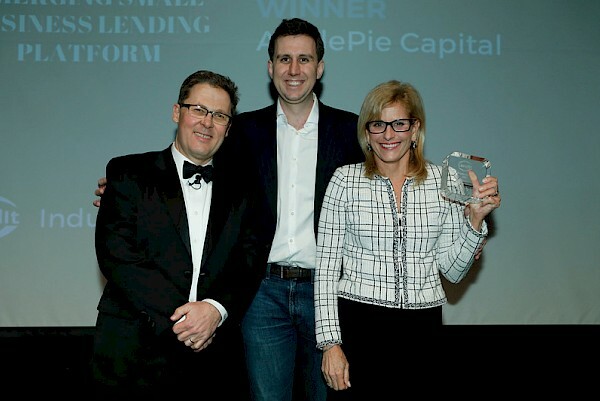 At this year's LendIt conference, ApplePie was honored to receive the award for Emerging Small Business Lending Platform, awarded to the young company that has demonstrated the greatest potential to impact the future of small business lending. ApplePie was nominated alongside fierce compeition including Capital Float, Credibility Capital, Lendio, Lendix, and Wunder. LendIt, the world's premier online lending conference, took place March 6-7 at Javits Center in New York City. The first annual LendIt Industry Awards honored innovation, emerging talent and top performers in lending and fintech. The LendIt Industry Awards process brought together more than 30 industry experts to judge 78 nominated companies and to select 14 award winners that best represented innovation, emerging talent and top performers. ApplePie CEO Denise Thomas reflected on receiving the award, "Each day, our team works with everyday entrepreneurs to further the American dream. I want to take this opportunity to acknowledge them in building what ApplePie is today. They have all worked tirelessly to help transform franchise finance and made a difference in the lives of the customers we serve. Let’s continue to build a great company!" Special mention for QED Investors, early investors in ApplePie and many of the other nominated companies, for winning Top Fintech Equity Investor. Congratulations to all the nominees at LendIt! ApplePie CEO, Denise Thomas accepting the award with Orchard CEO, Matt Burton and LendIt co-founder, Peter Renton.